One month from tomorrow I will be stuffing/"judging" my face with 30 or so of LA's best cupcakes [analysis of all 32 entries of last year's event here]. Would you join me? Tickets still available. Los Angeles - Lets get reaaaaaady to rumble! The baking gloves are coming off as the best bakeries from around LA and Orange County will compete for the title of "best cupcake" and "best bakery". Attendees will have an opportunity to taste and judge dozens of bakeries' best submissions and put to rest which bakery makes the best cupcake in Southern California. 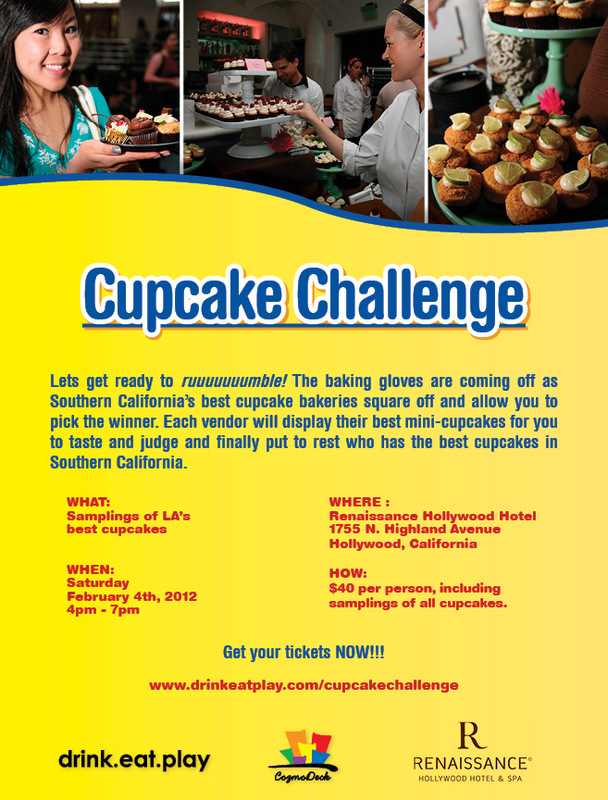 The Cupcake Challenge will take place at the Hollywood Renaissance Hotel and Spa on Feb 4th from 4pm to 7pm. Returning from last year's event will be Hansen's, Sugar Babies, Double "D" Cupcakes, The Cake Mamas, Friandise Pastries, and previous winners Sugar Jones, Polkatots and Jus Minis. New additions include Sweet Dreamery, Secret Marmalade, Sweet September, ButterSweet, Wonderland Custom Cakes, Sweet Red Peach, Bits of Cakery, [desi]gn Cakes, Dulcitas, Diana Sproveri, and Debiteful Cups. Hi, I am so excited to go and just bought my ticket. Can you tell me what to expect? Do we need to bring a box for the cupcakes, do you get to take any home, etc? Also, is there any type of dress code? Any info that you can provide is greatly appreciated! Hey! You're going to love the Challenge. You are allowed one of all the entries (30-40 in total). Most are minis (which is just fine after a few...). You are allowed to eat them there or bring home. I definitely recommend some sort of box/holder. They don't provide anything - although worst case you can usually snag an empty cupcake box from the bakeries at the event. No dress code, but I certainly recommend something comfortable as stomachs WILL expand. Enjoy!